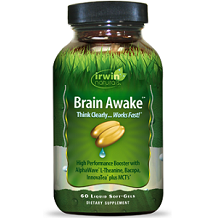 Today we are reviewing a product called Brain Awake by Irwin Naturals. 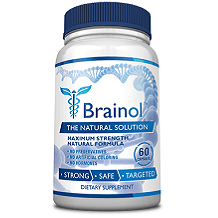 The maker’s of this product claim that it can boost brain function and mental performance, as well as enhance cognitive functions. Vitamin B6 promotes the production of hemoglobin, responsible for carrying oxygen throughout the body. The vitamins in the product are important for brain function, as well as for regulating mood and preventing mental fatigue. Since the product contains gelatin, it is not suitable for vegetarians and vegans. Take 3 softgels with a meal and a full glass of water. The manufacturer did not stipulate if the 3 softgels should be consumed as one dose or throughout the day. Consult a doctor before using any product to prevent side effects and to obtain the best results. This product contains a chemical known to the State of California to cause birth defects or other reproductive harm. California Residents Proposition 65 WARNING: (State of California Prop 65). You can purchase a bottle of 60 softgels directly from the official website for $22.99 with free shipping. This is only enough for 20 days’ of use when taking 3 capsules per day. The manufacturer did not offer any new customer incentives or bulk purchase discounts. The manufacturer does not offer a guarantee or return policy on this product. We found some positive aspects to this product. It contains some beneficial ingredients that may contribute to some clearer cognitive and focus improvements. The product is sold with free shipping included. On the less positive side we do have some concerns about this product. There is a scary warning on the product label about a cancer causing chemical in the product. Since the product contains gelatin, it is not suitable for vegetarians and vegans. The manufacturer did not offer any new customer incentives or bulk purchase discounts. At $23 for a 20 day supply, this is not a cheap supplement to purchase. There is no guarantee or return policy offered by the manufacturer. Dosage instructions are a bit vague. The manufacturer did not stipulate if the 3 softgels should be consumed as one dose or throughout the day. There is no assurance that the product is made an FDA certified facility, that its ingredients are non GMO, or that it is free from fillers and binders. In terms of reviews, many were less than positive with people saying they saw no results or others experienced side effects such as headaches. For all these reasons we are not recommending this supplement. Look for one with a reliable guarantee, a competitive price, bulk buying discounts, safer ingredients, and more positive reviews.